The night started with the support band - Seven, who come from the Czech republic. Doro fans may know of the band purely because of their guitarist, Honza, who guested at Doro's 25th anniversary show in 2008, which was recently released on DVD. That is the only reason any of the fans here tonight are likely to have heard of this band. They play progressive metal, but really don't seem to excite tonights crowd - while they get applause between songs, during their set the crowd seem fairly unimpressed and theres little sign of enthusiasm. Perhaps Doro's crowd isnt the right audience for Seven. 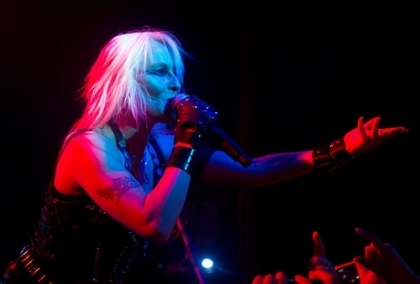 Next up was the Metal Queen herself - Doro Pesch. Coming on stage she launched straight into a blistering verison of "Hellraiser", and right from the start the crowd were going nuts, and she responded to that energy. 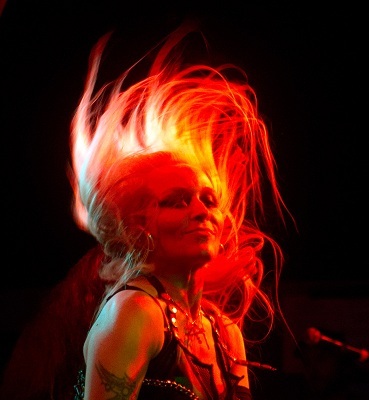 She raced through a few more Warlock classics - "I rule the ruins", "Burning the witches" and "Fight for rock", before doing a track from her last album, "The night of the Warlock". During the show Doro is constantly moving around the stage interacting with the crowd, headbaning furiously, getting the crowd to clap or sing along, and generally putting in a superb performance. Her band do an great job of following her lead as she totally ignores the printed setlist and instead changes the order and adds or removes songs on the spur of the moment, yet her band never hesitate even for a second. They too put in a great set with some great musical performances and also interacting well with the crowd and each other. We are treated to Doro's tribute to Ronnie James Dio, and when Doro mentions his name the crowd immediately start chanting "Dio, Dio". Hero is a superb song on the album and hearing it played live tonight was really special. She followed that up with her cover of the Judas Priest classic, "Breaking the law", a song which has long been a part of Doro's live shows. A storming version of "All we are" closes the set, but rather than just singing it alone she has a friend from an ACDC cover band join her on stage to sing it with her, and also invites a few fans to climb up on stage to join in too. The end of the set arrives far too soon, but there's still time before curfew for an encore so Doro is soon back out to perform "Love me in black" and "East meets west", then sadly its 11pm and the show has to end. Doro celebrates her 30th anniversary next year and that experience really shows in her shows - she knows instinctively what the crowd want and adjusts the set to suit. A superb performance from a true professional.